The latest FTN95 and DLLs are available for beta testing via the following download link. This is for users who have v8.30 and want to test the latest fixes. An archive called demo.zip contains an additional program that illustrates new features in ClearWin+. This archive should be extracted to its own folder. Please do not post replies on this thread relating to %pl or %fr failures. Please be careful to create backup versions and make sure that each file is copied to its corresponding installation folder. the file saldlibc64.lib in the download appears to be the v8.3(Personal) file unchanged (dated 13/3/2018 at 07.30) as it was also in previous beta169 ... is this correct ? All the other files are updated versions. Yes that is correct. That file only needs to change when exports used by clearwin64.dll are added to salflibc64.dll (very rare). It is usually rebuilt for a full release just to make it look right. Now I sat down and tried to simply run the beta279 demo programs. I'm on Windows 7 on an old acer laptop. The ebTabs.f95 program is fine. It Compiles and runs under both 32bit & 64bit. This new feature looks like it will be very useful. However the same isn't true of demo.f95 however. 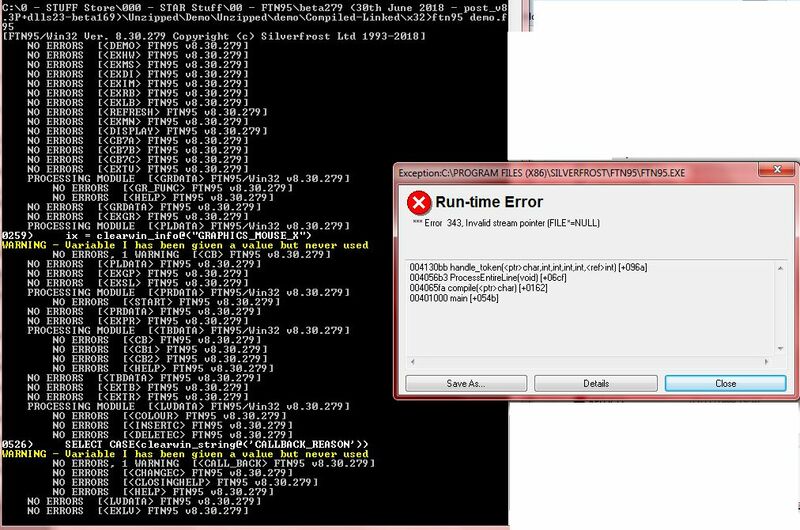 Note - although it says 'run Time Error' this is still in compile phase. First the compile phase appears to omplete OK,although as you can see below I get x3 'Comments' messages (in GREEN) about some variables will be truncated above a certqain length, as shown here. No idea what that's allabout. I don't understand this error message. clrwin.ICO exists, you can see it in the explorer window to the right of the error wiindow. Any ideas why this is happening Paul ? John Silver: I have seen similar problems occur when (by mistake) I used a PATH setting that caused a the FTN95 DLLs were not all from the same release or if some of the DLLs and the compiler (FTN95.EXE) were not from the same release. Here is what I see from compiling demo.f95 from the 8.30.169 release, using only the .169 release tools, 32-bit mode. 1. The warnings regarding variable I being given a value but never used are appropriate, but the wrong line numbers are shown. The lines containing the assignment to variable 'I' are 261 and 533, whereas the messages give 259 and 526. 2. When there is more than one such assignment to a variable the value of which is never used later, only the first instance is listed. This is appropriate, although "...only the first occurrence is flagged..." would be more helpful in fixing the code to remove those warnings. Is there something that we should fix so that this linker warning goes away? The EXE that is produced appears to run fine (I did not check if the graphical output and GUI behaviour are correct). In 64-bit mode, we again see the behavior noted in Items 1 and 2 above, but not 3. Instead, the 64-bit EXE fails, with a pop up saying "clrwin is not available as an icon resource at address 1c008559". John reported seeing this pop up at the link stage, but if he used /LGO the demarcation between linking and execution may not be obvious. The 32-bit compilation logs a call to the resource compiler "[Silverfrost SRC/WIN32 Ver 4.07 Copyright (c) Silverfrost Ltd 2018]", whereas the 64-bit compilation does not do so; perhaps the latter failed to call a 64-bit built-in version of SRC to process the RESOURCES section of the source file DEMO.F95. This problem occurs only if the compilation and linking are done separately. If the /link or /lgo options are used, no problem is seen, and an invocation of SRC.EXE is flagged. As far as compiler-linker behaviour as applied to DEMO.F95 is concerned, I find that the new beta release is no different. In short, if you use the /link or /lgo option with /64, the new beta release produces a 64-bit EXE that runs fine. Both programs work correctly for me but I tested using Plato under Windows 10 and not Windows 7. The problem about the missing icon relates to the need to use /r on the SRC command line when compiling the resource script. The linker should then be presented with the resulting .res file. I tested from Plato so I guess that Plato sorts this out automatically. Paul, May be good idea to post the full this beta release with the installer on your website. I was unable to run my programs with this beta from start. Sometimes the mix of releases do not work well for testers. Specifically sensitive is Clearwin+ part of the FTN95. Thanks mecej4 for your input. It don't think it can be a problem with PATH etc ... because all I've done is replace the 6 dlls, and the .EXE in the already existing installation and directory and the 2x MOD's & the .INS in the 'include' sub-directory. and when it's run the error about the clrwin.ICO file no longer occurs but the Access Violation error is still there, and no executable is created ! So no more ideas of what's causing this Access Violation ? How should I procede to track it down ? Debugger ? ... if so, how ? seing Dan's comment, and noting mecej4 that you say that the beta279 creates the .exe ok for you, could it be related to me using the Personal Version combined with what Dan says ? or maybe something related to the beta files being generated from PLATO but used in command line ? You do not need a batch file for such a simple job; however, if you use one, don't expect some lines in the batch file to be treated as commands and some lines to be input directives for the linker. The personal edition produces EXEs that differ from paid-up compiler generated EXEs only in that the former throw up a banner for a few seconds. If you give the linker a file name with no suffix, it will add ".obj" by default. Therefore, you must explicitly add ".res" to the compiled resource file. The following commands produced an EXE and ran it for me. Thanks mecej4, but even running your script produces exactly the dìsame Access Violation. so I still don't see why one has to put the .res on the end. But as it fails anyway it's not the answer. However, I have traced it being simply down to the RESOURCES compilation !!! So, why isn't SRC working on my machine ??? Resource scripts have the .rc extension and a different form to that shown above. Why not just run the demo from Plato? Remove the first two lines, i.e., the lines starting with "!==" and "RESOURCES", as well as the last line, with "!==", from the input file to SRC.EXE, which should be given the suffix ".RC", as Paul noted. ... which not the slightest bit of difference. The file was aleady with the .RC extension btw. in the 'Access Violation' actually mean ? what is location 000001 ? 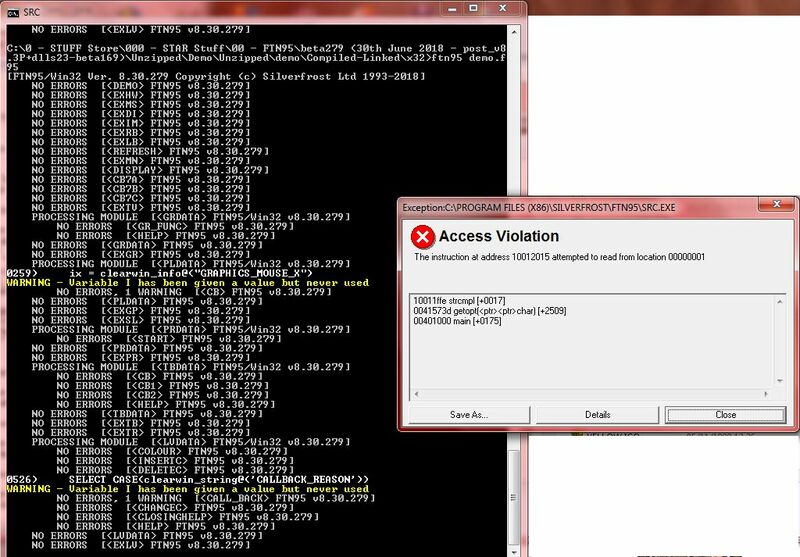 and it gives exactly the same Access Violation error ! I even ran SRC RESOURCES2.RC where the resource file contained just ONE of the lines, nothing more. Same error. It get wierder and wierder. When we find it the reason will be Oooooooh So Simple ! #GarethSouthgateWould tell me to keep concentrated, keep it simple, and if I'm still stuck in 11days time (he's not free before then ) offer to fly straight back after the medals presentation, debug it for me even though he has zero programming skills. You may have a corrupted or otherwise faulty version of the resource compiler. My SRC.EXE is 1,221,632 bytes long, dated 03/13/2018 (mm/dd/yyyy) and has a CRC checksum of 1221632. It prints a version number of 4.07 when run. P.S. Correction: the checksum is 3295731287 according the the Cygwin cksum utility, and F1BB23AE according to the crc32.exe from http://esrg.sourceforge.net/utils_win_up/md5sum/ . The discrepancy needs to be resolved, but I'll leave that for another time.